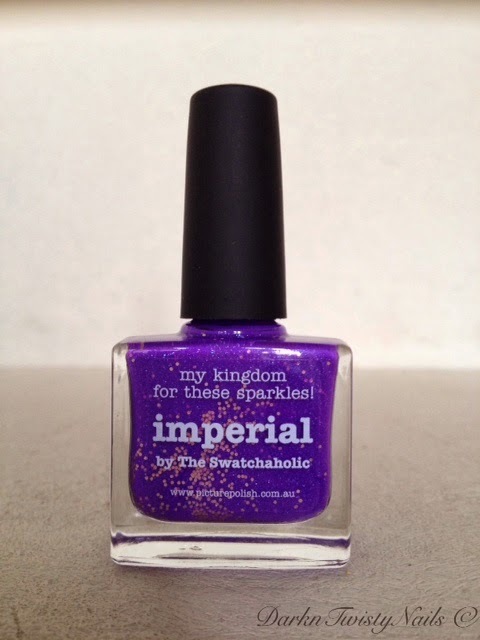 A few days ago, I was talking to a friend about which polish to get and I mentioned that I rarely wear purple polish, but if I do, I always love it. 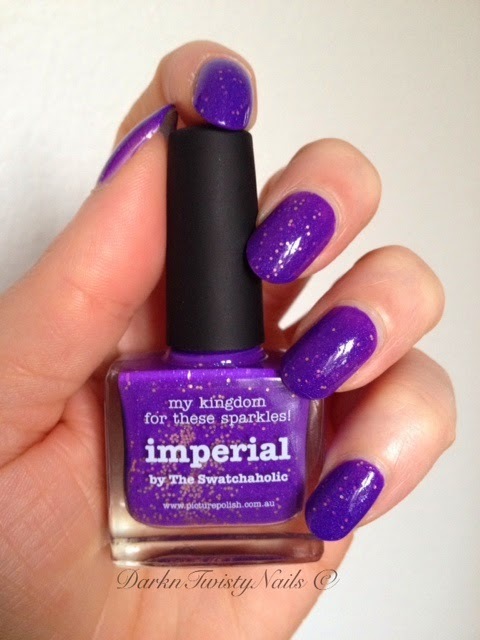 So the next day, as I took off my polish, I decided to give purple another go. This polish jumped out at me and had to be the one to go on my nails. 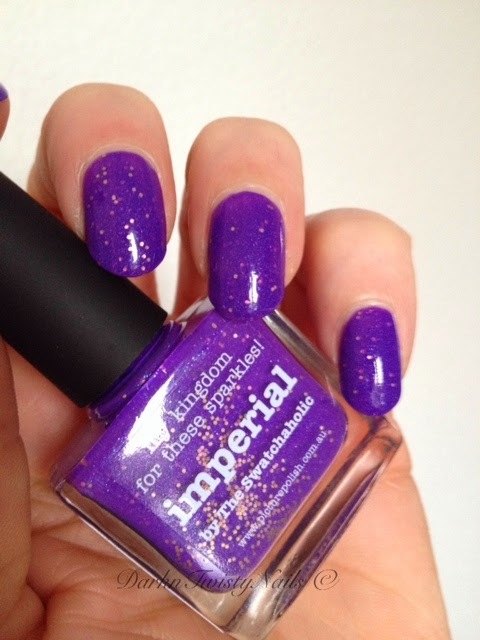 piCture pOlish Imperial is a bright, vibrant purple base with a scattered holo, blue micro glass flecks and small gold hex glitters. This shade is a collaboration shade, made with The Swatchaholic, if you want to read how she came up with this shade, you can read her story here. The formula is really nice, it's super opaque, only 2 coats needed and it flows on the nail with ease. Because of the neon quality of this polish, it does dry to a semi matte finish, so in order to get it to shine, you need a glossy top coat. I have to say, I don't really see the holographic in this polish, but I don't miss it, not at all! I absolutely love this shade! 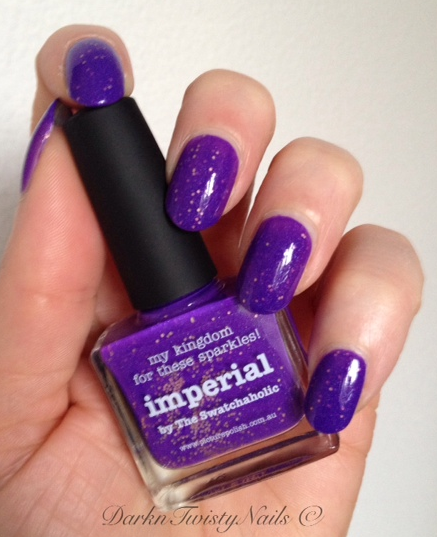 It's so vibrant and rich, if you love purple polish, you need this! (Yes, Marianne, I'm talking to you!) The only thing I don't love about this polish, is the fact that it is nearly impossible to photograph correctly! It took me about a hundred tries to get these photo's and they are still not quite right. These are a little on the bright side, but they do come really close! This is the first Picture Polish I've ever tried and I understand why people rave about this brand. I love it and have already purchased just a few more. You need this in your life, trust me! Gorgeous! I don't have one picture polish!! They aren't cheap, but this one is totally worth the money! I didn't own any, now I have 3 and 4 more on the way, lol. Ik zie je post nu pas, shame on me! Staat je erg goed! Ben benieuwd wat ik er morgen van vind op mijn nagels, ben m nu aan het lakken :). Kon na jullie positieve verhalen natuurlijk niet achterblijven haha!